In the past, the Corvina was defined as the queen of the grapes from the Verona area, and is in widespread cultivation. It is a vigorous variety and is resistant to cold and various diseases. It grows in a semi-erect manner and has medium sized, pentagonal shaped leaves. The grape bunches are cylindrical, of medium size, are pyramid shaped and winged. The grapes themselves have a blue-black color. It matures around the end of September or the beginning of October and prefers soils that are alluvial, morainal, preferably located in the hills, and well ventilated. It gives color and body to wines that are made from it. The scent it gives is initially floral scented, but slowly becomes more fruity. Is also known as Corvina Veronese or Cruina. Translated: “Big Corvina” .There is argument as to whether this is a specific variety or a relative of Corvina, however since the 1980s it has been considered as a separate clone or variety. There are apparent differences, for instance larger berries with more tannin and colour and a higher sugar content with ripening, which is later than Corvina but still retaining the thick skin associated with the former. 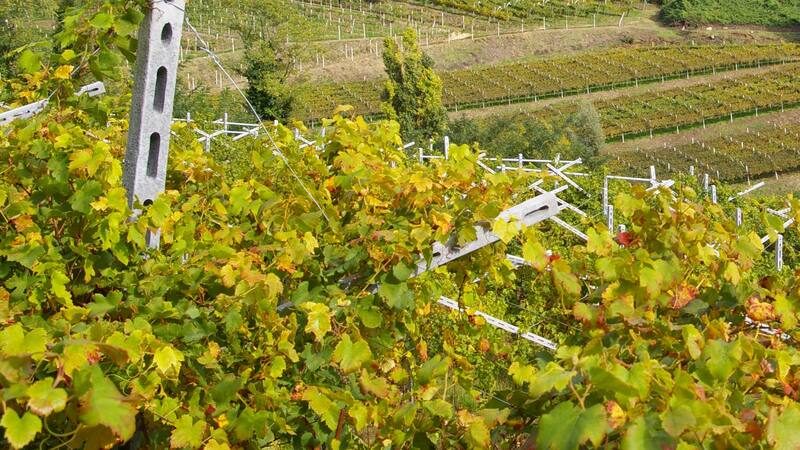 The vine produces compact, cylindrical pyramid shaped bunches with a single wing. More blue in colour with a smooth thick skin. Finally is does not suffer like Corvina with non-fruiting buds and matures somewhat later. Vulnerable to attack from Botrytis even more so than Corvina and another vine which benefits from hillside sites and can give better concentration than Corvina in the right conditions. Rondinella is a variety with medium bud break and medium-late ripening (end of September –beginning of October). Good, at times high, vigour and good and regular productivity due to the regular fertility of buds. The leaves are medium sized, and the bunches are rather cylindrical, loosely-packed, with round, black, violet colored grapes. Like Corvina it responds well to “appassimento” as its small berries evaporate quicker.